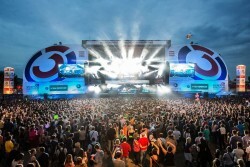 From 24 to 26 June, Vienna's Danube Island becomes a mega-party site for around three million visitors. About 1,500 artists offer a continuous program on around a dozen stages at the Danube Island Festival. There's entertainment on various themed islands to suit every age and taste, while numerous catering stands keep everyone well fed and watered.